Never before has it been more clear that “churches” in America have not been fighting spiritual warfare as directed by God. See After Salvation. The treatment of one of Satan’s main spiritual leaders, the Pope, proves this as do other facts. One of those facts is the spread, before our very eyes, of luciferianism and magic. Children (see, e.g., PBN children’s programming) and adult programs on television, in the movies, and music are preparing the way for the anti-christ by teaching, e.g., magic and luciferianism. This article is actually based upon an entry on “The Trials and Tribulations of the OPBC ‘No Small Stir’ Street Preaching Ministry.” This article clearly illustrates the clash between good and evil in America. 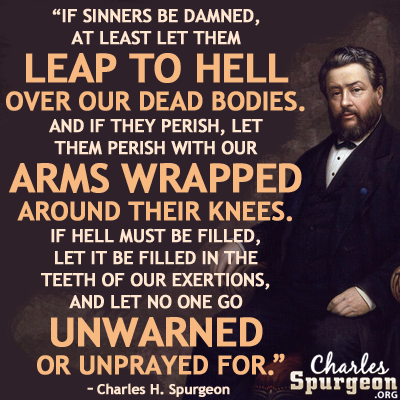 Sadly, most “Christians” have no idea what is going on nor are they following their Lord and fighting evil on any (most “Christians”) front or all fronts (almost all “Christians”). The clash is centered in the public speech forum in front of a luciferian bookstore in Dinkytown. Believers, luciferians, and all who are interested in what is going on in the spiritual realm should listen to Luciferianism, Enochian Magick, Aliester Crowley & Dinkytown Witches. Satanists hate the free speech that came about because of the persecutions and spiritual warefare of our historic Baptist brothers, sisters, and children. Yet they want to communicate their lies to others. Freedom of speech as guaranteed by the United States Constitution, First Amendment, the Minnesota Constitution, and the city of Minneapolis Charter and Code of Ordinances is especially important in this situation. To understand why, go to Luciferianism, Enochian Magick, Aliester Crowley & Dinkytown Witches. On this date, Old Paths Baptist Church (“OPBC”) men went to Minneapolis MN to preach in the public forum. Some were assaulted. A peace officer came and told them to leave in 5 minutes or be arrested, thereby violating their civil rights (First Amendment speech rights). The men of OPBC understand the limits of the law concerning street preaching; they know that freedom of speech does not allow them to criminal trespass, obstruct highways, passageways, and doorways, to assault anyone, etc. But they also know that their speech cannot be suppressed by the police or anyone else in violation of First Amendment law or based upon pretense. The law on this is available on various resources linked to on this site. See, e.g., other information on this webpage, Tract, Street Preaching in America: Is it Legal? or For greater understanding of the free speech rights of Americans in the public forum click left click here and read the brief of Jerald Finney in the Steve Drake case. See the bias, arrogance, abuse, and lack of legal knowledge of the peace officer at: https://www.youtube.com/watch?v=Lh4h8q_WbkY. See the actions toward street preachers of a Minneapolis Police Officer who understands First Amendment law concerning speech in the public forum at: Minneapolis Police Officer understands the First Amendment. OPBC will make a sincere effort to handle this matter without the need for court intervention. They men of OPBC will be returning to street preach at Dinkeytown and want to make sure the officers know the law so that they can properly perform their duties according to the First Amendment to the United States Constitution and the Constitution of Minnesota. 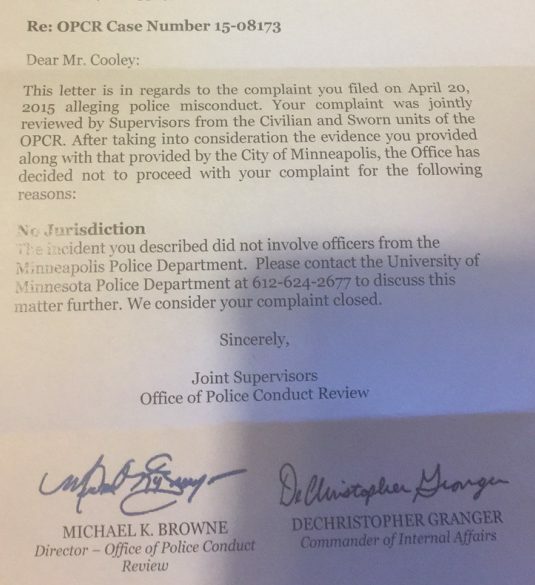 OPBC does not want to cause unnecessary expense to individual police officers, the University of Minnesota Police Department, the mayor and city council of Minneapolis, and the taxpayers of the city of Minneapolis nor do they wish to waste the time God has given them by addressing well settled legal matters in court. I am writing this note as a member of and on behalf of men whose civil rights were blatantly violated by the Minneapolis Police on April 18, 2014. The men are members of the church I also belong to, OPBCin Northfield, MN. I write this as a member of the church, not as a legal representative at this point, although I am an attorney who now practices in Texas. I plan to move to Northfield as soon as I can. Should legal action be required, the men already have talked to an organization which will provide legal assistance in Minnesota. I write this in hopes that this matter can be resolved without civil suit and without getting an attorney involved. Suing in federal court for the gross violations of the Minneapolis police can only cost the taxpayers of Minneapolis a lot of money for a hopeless cause. The story of the men whose rights were violated is all on DVD. It will be online on my website and also on facebook very soon. The law is clear as to the rights of people to preach, teach, speak, etc. on the public forum. The police, as I understand it, threatened the preachers with arrest for disorderly conduct and hate speech, if they did not leave in 5 minutes. The police did no investigation; they just threatened the street preachers. The street preachers know all about the law involved. I am sure that you, as city attorney, are very familiar with First Amendment speech rights in the public forum. So that you know that the street preachers are also familiar with that law, you may refer to a tract which they are familiar with and which I wrote: the tract, “Street Preaching in America: Is It Legal” is online at https://opbcbibletrust.wordpress.com/b-messages-from-pastor/street-preaching/tract-street-preaching-in-america-is-it-legal/. More legal information on free speech rights in the public forum is linked to on the website page listed in the next paragraph, a page they are familiar with. These men have had to deal with matters like this before. You can read some of their trials and tribulations at https://opbcbibletrust.wordpress.com/b-messages-from-pastor/street-preaching/december-25-2013-an-unfolding-street-preaching-battle-in-northfield-minnesota/. In every case on that cite, you will find that the city police and government involved relented when the civil rights violations were brought to the attention of the city attorney, mayor, city council, Chief of Police, and police departments. The police department was instructed as to the law of speech in the public forum and thereafter ceased to violate the rights of the public speakers since they obviously did not want to waste taxpayer money for issues which are firmly entrenched in American law. Hopefully, we will be able to resolve this matter in accordance with the law, and the police department will be educated on and thereafter do their job in these type situations (to protect peaceful public speakers who are exercising their constitutionally guaranteed freedoms from those who are so offended by protected speech that they lie, assault, etc. those who say things that upset them in public and so forth). The street preachers have informed me that at least one of them was assaulted by an offended listener, yet the police refused to follow up on their complaint concerning the assault. The complaint was only made after the police rudely violated the civil rights of the preachers. I will be contacting the chief of police, the city council members, and the mayor in our sincere attempts to resolve this matter in the most reasonable, lawful, and Christian manner without having to resort to legal actions which will cost your taxpayers a lot of money. I received a response from the city attorney to the above e-mail on 041915 requesting specifics of the location of the incident. I promptly replied and included a link to the Youtube address (https://www.youtube.com/watch?v=Lh4h8q_WbkY) of the video of the encounter with the police. You can file a complaint against the officer online and I have attached the link to this email [link removed]. You can also call Police conduct for them to review your video at 612-673-5500. If there is anything else we can help you with please contact us. Thank you for emailing the City of Minneapolis. Please take a moment to rate your experience with Minneapolis 311. Click on the link below to provide us with your feedback. Pastor Jason filed a complaint on 4/20/15 and will be called Police conduct to have them review the video(s). If need be, the e-mail addresses for the city council members and city attorney will be obtained , letters will be e-mailed to them, etc. Hopefully, the actions already initiated will, when completed, resolve this problem. I will be dealing with the UMPD according to their guidelines (Addressing Concerns or complaints) starting Monday, October 12, 2013 and will supplement this article accordingly. I will begin by trying to handle this informally, but it that does not work, a formal written complaint will be filed. Again, as always, these actions are being taken in an effort to settle this matter without having to go to Federal Court. Such action can cost the citizens of Minneapolis (or the University of Minnesota), as well as the department and individual officer(s) involved, a considerable amount of money in attorneys’ fees alone; and all for a hopeless cause the law of which is well established in American law. Of course, should the Chief, the Mayor, the City Council members, and the city attorney fail to respond properly, they, as well as the city, may also become subject to suit. The OPBC street preachers street preached in Dinkeytown and then outside the University of Minnesota football stadium (during and after the Minnesota/Michigan football game) on October 31, 2015. I e-mailed a letter of thanks to the appropriate Minneapolis officials on November 2, 2015. Click here to see a copy of that letter. At this point, the problem seems to have been brought under control. The men of OPBC want to thank Lieutenant Wilske for his courtesy and professionalism in dealing with them and this matter. Other DVD’s taken at the scene are not published online. 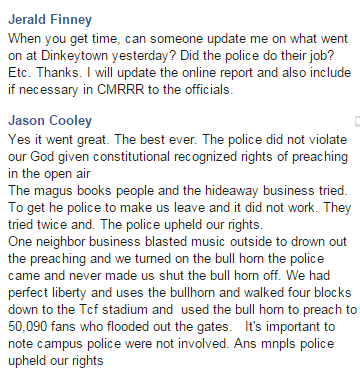 The Minneapolis Police have now done their job, to this date (November 23, 2015) when the men of OPBC have street preached there. On November 4, 2015, I received an e-mail from Lieutenant Wilske in which he said that he understood 1st Amendment rights and will refresh the officers memories on this. The men of OPBC street preaching ministry, as should all citizens of the city of the United States, wish to thank Lieutenant Wilske and the other Minneapolis police officers who respect and obey the law. The freedoms provided for in the Constitution of the United States and lower laws make this a better place to live.